American Grand Prix driver Dan Gurney and fellow countryman Carroll Shelby, creator of the legendary Cobra sports racing cars, joined together to form All American Racers (AAR). The team which was sponsored by Goodyear was formed to win Indianapolis which was then dominated by Firestone equipped cars. Gurney currently driving for Brabham in Formula 1 also wanted to construct a proper Grand Prix car to race on the road courses of Europe. Based in Santa Ana, California, they hired ex-Lotus designer Len Terry. Fresh from his success in designing the Lotus Type 38 that had just won at Indy in the hands of Jim Clark he designed a similar car that was intended for both Indy and Europe. Rather than the offset suspension of other Indy cars the Eagle had symmetrical suspension, the better to race on road courses. Four chassis were completed for the 1966 season. The GP team was call the "Anglo-American Racers" in deference to its British Weslake engine. This engine was created by ex-BRM engineer Aubrey Woods. The design had previously been rejected by BRM in favor of their H16. After starting the season using a 2.75-litre Coventry-Climax engine the Weslake was ready for Monza. Unfortunately fuel problems and overheating ended the cars race after 17 laps. Continued overheating marred the last two races of the season. After starting the 1967 season in one of the Coventry-Climax powered cars the Eagle-Weslake returned for the non-championship Race of Champions at Brands Hatch. Joined by new teammate Richie Ginther the team ran 1-2 in the final before brake trouble halted Ginther's race. Gurney still in the lead managed to hold off a fast charging Ferrari to claim his team's first race. Ginther who was not able to qualify for Monaco abruptly retired. After putting the heavy Eagle on a diet, Gurney was ready to challenge the leaders. At Spa history was made as Gurney set a new lap record on the way to a stirring victory thus becoming the first American to win a Championship Grand Prix in an American car of his own make. This victory would prove to be the high point of Gurney's career and also that of Eagle. 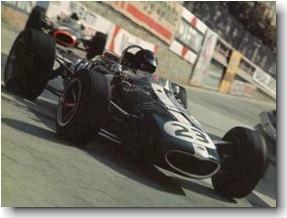 In 1968 Gurney severed his ties with Weslake, as the Sussex firm was not up to the rigors of Formula 1. A homegrown engine was under development and did actually race but lack of funds soon put an end to AAR's European racing efforts. Considered by many to be one of the most beautiful Grand Prix cars of all time the Eagle was destined not to race again. AAR would limit their racing to the United States for now. Photo copyright: The GP Library.